Seniors benefit tremendously from LaughingRx. LaughingRx is easy and safe and provides a simple form of exercise that can be done completely in a chair or standing. LaughingRx is simple to catch on and is appropriate for everyone, regardless of their cognitive and physical abilities. It's a wonderful experience that the elderly can share within a group and gives them a wonderful social group interaction as well as sense of well-being. 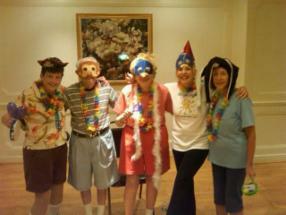 Classes are tailor-made specifically for the elderly while making it fun for all! In the LaughingRx program, seniors seem to gain a more positive outlook and reduced depression symptoms. Health improves, many chronic ailments disappear, the exercise improves mobility and staff-patient communication and relations also improve. People with senile dementia and the onset of Alzheimer’s show remarkable improvement. Nira Berry can provide classes for the elderly weekly or bi-weekly. Caretaker classes / seminars available. RSVP to: Holy Cross Senior Source directly- info on laughter class schedule page. Physical health of a person is an important parameter to measure mental health. It has a strong influence on personal efficiency and performance, well-being and capacity for self-regulating thought and action, self-confidence and relationships. A physical impairment can lead to severe mental trauma and stress which counters wellness. People suffering from a physical disability are prone to negative feelings and emotions that undermine their rationality and gives rise to confusing mindset regarding their own image and capabilities. They undergo an all time low and sensations of self pity and self worthless set in. Nira Berry's LaughingRx Laughter Yoga exercise routine is the best medicine and the most powerful tool to manage pain and distress. It has the ability to elevate the mood state by releasing endorphins, a ‘feel good’ hormone that alleviates pain and provides a feeling of comfort and safety. The concept is the fastest growing trend in the world that helps people to cope with their physical and mental disabilities. It a simple exercise routine developed by Dr. Madan Kataria that works on the body and the mind simultaneously. It effectively combines the tenets of yogic breathing with laughter exercises to provide enormous health benefits. Many practitioners have reported a remarkable improvement in their physical condition and flexibility. Mobility: Mobility sometimes gets partially or severely restricted due to disease, injury and pain. Being a physical exercise, LaughingRx Laughter yoga helps mobility especially if one is rendered physically incapable due to injury and or disease. Many people with a physical disability are unable to move parts of their body without regular physiotherapy exercises to keep their body moving. Due to low mental functions, they were not following physiotherapy commands properly. After laughter yoga they are much more compliant with physiotherapy commands, which have led to notable physical improvement in their motor functions. Pain: Laughter Yoga triggers the release of a natural opiate called Endorphin into our bloodstream. This provides immediate pain relief typically lasting for 2 hours. It can relieve headaches, muscular and joint pain and is powerful enough that a number of practitioners have undergone surgery using laughter instead of anesthetics. Anger: It can be overwhelming trying to understand why you have to deal with something that can be so difficult and seem so unfair. ‘Why me?’ is a nagging question in the mind. Trying to live with disability can be really frustrating and leaves one dependent on people. Laughter Yoga is an ideal exercise that helps one to accept the disability and provides relief from feelings of negativity. Sadness or depression: People find it hard to express their feelings and emotions and they get chronically depressed. Laughter Yoga exercises have made them much more expressive and joyful and helped to lift their depression. Feeling scared: It’s natural to experience a certain amount of fear in the face of physical disability. But when this fear takes on an unbearable dimension, it can lead to severe damage to the psyche. Laughter Yoga provides an immediate feeling of safety and security. This may be due to the effects of endorphins, natural opiates and more potent than morphine. It helps to overcome fear and anxiety and generates more positive emotions. Stress or anxiety: Any form of disability is a cause of immense stress and anxiety. Frustration anger, aggressive behavior and irrational logic overcome the power of reasoning. Laughter has been shown scientifically to provide a substantial and immediate reduction in stress levels as it lowers stress hormones like cortisol and epinephrine and enhances the levels of health hormones and neuropeptides that alleviate the negative symptoms of stress within minutes. Shock and denial: Physical incapacity can put people in a state of shock and trauma. There is not just the physical pain but a mental denial that can lead to blockage of feelings and an inability to express one’s emotions freely. The group dynamics of Laughter Yoga leads to more openness and helps people to share their grief. The exercises and the deep breathing relax the body and the mind and assist one to accept reality. Laughter clubs are a safe haven for people to release their inner feelings without fear and pain. Laughter catharsis is a great technique for emotional release and balance. The inventors of yoga thousands of years ago probably did not envision plastic camouflage helmets, conga lines, and Kool and the Gang's "Celebration" as part of the routine. But Nira Berry doesn't particularly care. In fact, she'd probably laugh them off. Berry is a teacher of laughter yoga, a series of role-playing exercises and relaxation routines that allow people to laugh out loud without trying to crack jokes. She even has an arresting motto for newcomers who don't think they can force their way to authentic guffaws: "You fake it until you make it." "You don't need to have a sense of humor to laugh," Berry told about 50 participants, mostly newcomers, at a laughter yoga session at Suburban Hospital on Dec. 9. Berry's routine consists of four components: laughter, clapping, breathing and "childlike playfulness." The exercises range from simply waving one's arms back and forth while chanting "Ho ho, ha ha ha!" to multi-step routines that incorporate laughter into physical imitations of morning routines. When participants mime spreading shaving cream on their faces, they giggle and pretend to smear the stuff on their neighbor's cheeks. They even mock the laughter of co-workers. At one point, Berry stands on the stage, divides the group into three laughing styles of "Ho!" "Ha!" and "Hee!" and, just like a comedic Kurt Mazur at the New York Philharmonic, waves her arms rhythmically over the crowd and prompts different cadences and patterns of laughter. The group then moves from the orchestral to the downright absurd, donning piratical hats, wigs and Hawaiian leis and forming a conga line that parades down the aisles and through the seats for more than five minutes to the strains of "Celebration." Participants are told to stomp on imaginary everyday problems and cackle derisively. Every routine is punctuated by Berry's infectious laughter. Veterans of laughter yoga are particularly bold, bellowing out grotesque and twisted forms of merriment that in turn draw out the laughter of more cautious participants, creating a mutually reinforcing echo chamber. At one point, Berry flubs a line in her yoga rap song, sending people off on a new round of laughter. "It's crazy, isn't it?" Iris Andris of Bethesda whispered in the middle of the recurring "Ho ho, ha ha ha!" chant. Only the 15-minute deep-breathing and body-awareness routines at the end of the session recall typical yoga. But Berry touts the various health benefits of the practice, which was started by an Indian doctor in the mid-1990s. Ten minutes of sustained laughter, she claims, is the cardiovascular equivalent of 30 minutes on the exercise bike and boosts endorphin levels. She leads laughter yoga exercises for a wide variety of groups, from University of Maryland students to corporations looking for creative team-building exercises. Berry, whose business is called LaughingRx Yoga, got interested in laughter yoga during a bout with cancer eight years ago. During her recovery, when friends asked her if she wanted anything, she said she asked for things that made her laugh, like the movie "My Cousin Vinny." The practice is also supposed to help people with allergies and asthma. "I was looking for an alternative way to heal myself," she said. Andris said when she first heard about laughter yoga, she was skeptical. But after the one-and-a-half hour session, she felt relaxed and felt as if she had been through a real workout. She was also impressed with Berry's ability to overcome much of the group's initial timidity. "It was amazing watching her bring us all together," she said. Rockville resident Zohreh Movahed had done laughter yoga before, when her sister-in-law, an employee at the National Institutes of Health, told her about it. She said she was happy to laugh without worrying about offending people. "When people start laughing, you realize you're not alone," she said. Contact us for more information on how we can help you achieve your goals.